Central Community Hall north of Gwynne held its 50th Annual Steak BBQ as it continues to fulfil its role as a meeting place for the residents of the surrounding area. More than 120 people came to enjoy the big barbecued rib steak with all the trimmings topped off with ice cream smothered in mixed fresh berries. Delicious! Some of those present have retired from farm life and moved away, but returned for the supper and to reconnect with friends and former neighbours. Most present, from babes in arms to seniors, are still living is this active and close-knit community. 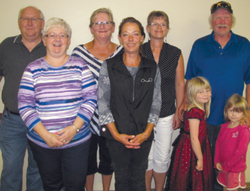 The Summer Steak BBQ is one of three suppers held annually at Central Community Hall. The others are a Turkey Supper in November and a Beef Supper in March. The first Steak BBQ was held in 1965. At that time and for quite a while, they would print 200 tickets and have a sell-out for every meal. Now times have changed. Fewer people live in the community. A vastly increased, variety of entertainment is readily available, both in the home and within the range of a greatly expanded sense of a reasonable driving distance. Nevertheless, there is still a good turnout for the dinners and a strong sense of community. Since the community came together in 1933 to organize for the building and running of Central Community Hall, the building and the activities within it have seen many changes. Funds were raised to start building in 1934, with the first dance held on March 1st, 1935. At that time there was no electricity, no water, only a wood-burning barrel stove for heat. Even the outhouses weren't built until the summer of 1935. An octagon booth was also built in the summer of '35, and a huge picnic was held. A well was added in 1943. In 1947, a light plant was added, with rural electrification bringing power in 1953. The 45 gallon drum stove was changed to a coal furnace, to a stoker, to propane in 1970, and to a natural gas furnace in 1975. Modern plumbing (water heater and running water for the kitchen and indoor bathrooms) was added in 1976. Throughout the years, the hall and grounds have been used for a tremendous variety of activities including dances, concerts, adult education classes, arts and crafts, keep fit programs, hunter training, variety shows, travel logs, speakers, ball games, picnics etc. etc. During the war years, some of the soldiers from the Army Training Camp in Wetaskiwin would come out for the dances and other events. Today it is booked every weekend all summer for events such as family reunions and weddings. Gwynne school holds its graduation in this hall each year. And, of course, there are the three annual suppers. The basement of Central Community Hall is home to the Crooked Lake Senior Citizens' Club, formed in 1979, which meets the first and third Wednesdays of every month. It is well equipped for a wide variety of enjoyable activities including shuffleboard, pool, various table games, and has a library and a kitchen. It is 81 years since a group of community leaders came together with a vision for a community hall, and with the will to make their vision a reality. Although they were nearly four years into the decade-long Great Depression, they worked together with the community to pool resources and labour to provide a setting for the community to meet for entertainment, learning, sports, and sharing meals. The continuing role of Central Community Hall testifies to their foresight and wisdom.